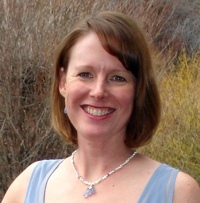 I am board certified in therapeutic massage and bodywork, a certified lymphatic therapist, Reiki master teacher, yoga instructor and artist who lives in Jackson, Wy. After a 12-year career in publishing and advertising, I decided to pursue a creative career in which I could assist people in a more direct and meaningful way. I had personally experienced healing through massage and Reiki, and found it to be the most helpful method for decreasing muscular strain and related nerve pain caused by postural issues from computer work and emotional tension. With bodywork, Reiki, lymphatic therapy, and now CranioSacral Therapy, I discovered not only a new career, but also a powerful approach for assisting others as they find balance within their bodies and in their lives. I aim to facilitate opportunities for healing as clients become aware of their physical responses to life stresses. In addition, I strive to provide a safe, non-judgmental and relaxing respite for clients.